The Federal Government has commenced an online registration for unemployed Nigerians for the sole reason of collecting up to date data of unemployed individuals in the country. Although, I stated the title of this post to be the way it was, because through this ongoing measures deployed by the FG to collect the data of unemployed Nigerians, many will be linked to existing vacancies in government agencies and in private sectors. Read on to get more information concerning this new development in the country. This new development in the country was stated to the public during the course of speech made by the Deputy Director, Information and Public Relations of the National Directorate of Employment (NDE), whose label identity (Name), is Edmund Onwuliri, in the past Monday, at Abuja. He further said that the exercise will make the directorate to serve as a clearing house linking or referring job seekers with existing opportunities or vacancies in government agencies and also in private sectors in order for them to get employed. This is a step in a right direction for those that are yet to be employed and those who are about to graduate from various schools and same time, for firms and entities that provides Job opportunities. As this will serve as a job exchange portal, that will link job seekers and employers together. So in other words, the online portal which the Deputy Director, Information and Public Relations of the National Directorate of Employment (NDE) spoke of has been opened for all unemployed individuals to make their registration using the necessary required details. The online portal in talk, just opened today being Wednesday 5th of April, 2017. 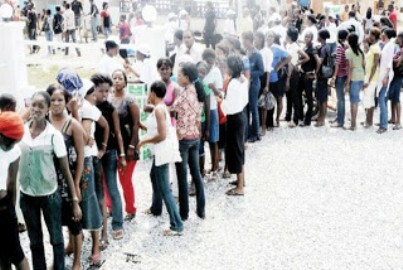 The address of the online registration portal was further stated by him as: Jobsforall. The deputy director continued by making all to understand that, the online portal would enhance and make employment go smoothly, without having the cumbersome process of recruitment by employers of skilled labor in private and public sectors. As this initiative will link up unemployed people seeking for job to their prospective employers with ease. In this current situation of the country, I hope and pray this initiative helps to reduce the high rate of unemployment in the country. What is your contribution to this development? Kindly, tell us through the comment box below. And don’t forget to share in order to let others know about this. Thank you.